Being a native of Atlanta, MLK day has always been special to me. Every year, I find myself reflecting on how far society has come, and giving thought to what work needs to be done to continue pushing society forward. However, last year I tried something new for the holiday. Given the great divide happening in America, I decided to explore different parts of the country in order to understand a broader depth of perspectives regarding conditions across the country. So I made it public and went for it. The idiom of “brothers and sisters” may sound cliche considering certain aspects of society have drastically improved since the ’60s, yet in 2019 this quote still proves sadly relevant in regards to a divided country which happens to be called the “United States”. Of course, there has been plenty of commentary on the multitude of historical, systematic and cross-cultural elements that makes America what it is today, so I won’t go too deep, I just want to share what I’ve been learning. Though there is a divided nature in America today, I will speak of it outside the context of politics. As I see it, the divide is merely one that departs the old from the new. The old being, those who are used to or benefitted from America’s past and want to maintain it. While the new are those who may or may not be fully aware of America’s history, yet still feel “the melting pot” that is our nation should continue thriving on the merit of its originality. In this case, those whom I’m referring to as the new, are much more reminiscent of King by carrying forward the idea that everyone should feel welcomed and everyone should be heard. From my journey around America thus far, the bulk of the stories I’ve heard are summed up within the context of this statement: people want to move past this era of hate in order to try and fulfill the charter of being a more perfect union. Today, given these polarized times, it can definitely feel like that thinking isn’t as abundant anymore, yet believe me, it is. Sometimes, we just have to step out of the news cycle, close out of social media and just go talk to one another to realize that what you want probably isn’t too much different from what I want. In starting my exploratory campaign last year, marking 50 years since the loss of MLK, I decided to call it [Where We Are Now], a nod to King’s last book Where Do We Go From Here. The point of the project was to explore perspectives from different regions of America in order to understand how far the country has come in 50 years. Given, how much I’ve learned and the mass amount of positive responses towards the campaign, I decided to evolve it into a full national docuseries. From my work thus far, I’ve noticed just how disconnected people are from the reality of what others are experiencing around the country. Yes, we get glimpses, but we hardly ever hear authentic stories that show what’s really going on in people’s minds. So I’m making it my goal to capture genuine stories that revolve around the culture of America and how it’s changed from region to region. 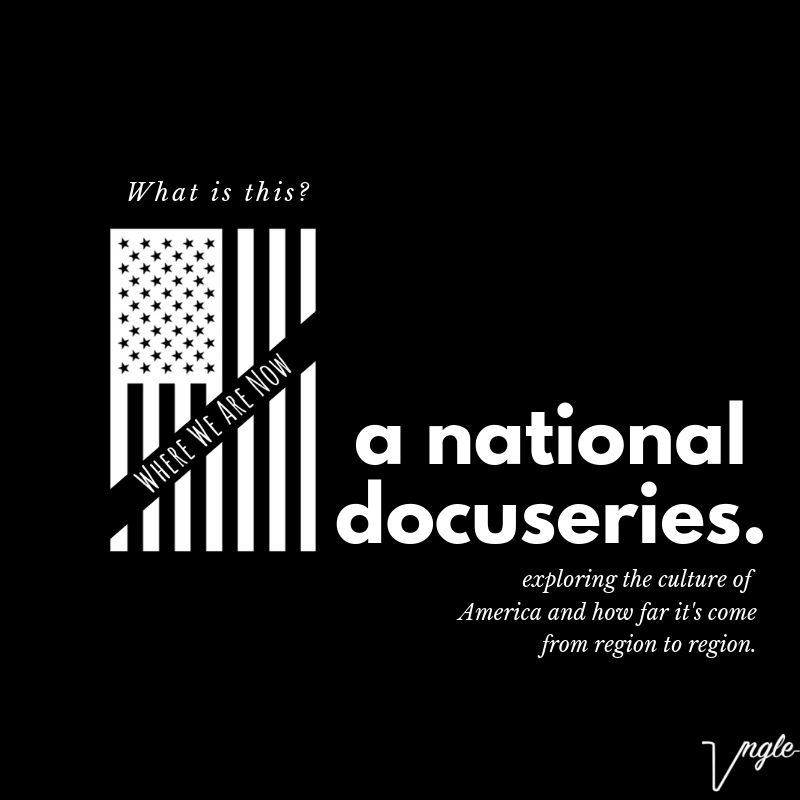 Through the [Where We Are Now] docuseries, I’m aiming to cut through all the noise that is fueling the polarization in America and create an impartial space for people to focus on regional matters happening around the country. The objective is to help Americans tell their stories. The docuseries will act as an avenue to broadcast real perspectives from across the country. Thus giving a clear way to understand the ranging culture of America and how its changed, while highlighting what direction citizens want to see the country go next. I’m carrying this out on my vlogging page called Vngle. I started it to be an impartial space for sharing “various angles” on culture. Through the docuseries, I’m striving to grow an open-minded community around it. One that is interested in discovering the stories that are too often swept under the rug, even if that story challenges their perspective. Nonetheless, I’m excited, yet I have a lot of work to do before I hit the road. In the meantime, I’ll be posting videos from my journey thus far @VngleStories. I hope to have your support. P.s. please support my work (and get a free shirt) through donating to my patreon).